← Oh say can you CSA! I love Eggs Benedict. I can’t pinpoint the beginning of my love affair, because my love has always been there. As Eggs Benedict features prominently in most menus, I don’t think I am the only one in love. For over 20 years, I resigned myself to eating Eggs Benedict in restaurants because I thought the sauce was too darn hard – the classic recipe for hollandaise sauce involves a double burner, a candy thermometer, and a metal bowl (none of which we own). But last Sunday, my partner, trusting as always in the infallibility of The Joy of Cooking and spurred on by my stated desire of what I wanted for our holiday weekend brunch, kept reading. He persevered, finding a recipe for hollandaise that doesn’t require anything special but a blender. And we own a blender, and we have fresh eggs that need to be eaten, and the entire delicious, plate-licking meal took us 6 minutes to make, and it was the easiest at-home most decadent brunch ever. Here is our two-person recipe for Eggs Benedict, modified with more lemon juice to ensure a big sparkle of citrus to offset the fat. 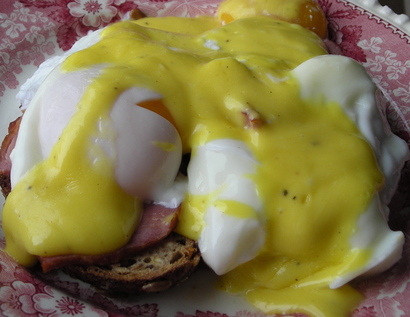 Four poached eggs, turkey bacon from freezer, leftover 8 grain 3 seed bread from Zingerman’s, Hollandaise sauce made in the blender: 2 egg yolks, 2 teaspoons lemon juice, 1/3 cup melted ghee (clarified butter), salt and pepper – voila! T-minus 6 minutes: Check coop for fresh eggs, return with 4 fresh new eggs to add to the 2 on the windowsill from yesterday, turn heat on for poaching egg water, melt ghee, slice off 4 chunks of turkey bacon and throw into toaster oven with slices of bread. T-minus 5 minutes: Separate 2 egg yolks into blender, add 2 teaspoons lemon juice, grind in pepper and salt, press toast on toaster oven. T-minus 4 minutes: Take a sip of coffee, watch the bread turn into toast. T minus 3 minutes: Set the table, scratch the dog. A brief step-out from our countdown. I learned to make poached eggs years ago. The trick was to create little tornadoes in the water with a spoon and then gently pour the egg into the middle of the tornado. The force of the tornado made sure the egg didn’t spread all over the place. If the egg was being difficult, you could add vinegar to the water. I always liked making water tornadoes with my spoon – so that is what I did. Or, that was what I did until we started keeping chickens. I don’t need to make a tornado in the water any more. A freshly laid egg has a white that is almost as firm as the yolk. I am able to simply pour it into the warm water. They are so contained unto themselves, they can be literally on top of each other and still be intact when you spoon them out. Okay, back to the countdown. T-minus 90 seconds: Turn blender on and start foaming the yolk and lemon juice. After 10 seconds slowly pour in the melted ghee. T-minus 30 seconds: (This takes some maneuvering to happen all at once). Remove toast and bacon from toaster, place the four pieces onto two plates, stack turkey bacon on top, remove the poached eggs from the water and place on top of bacon, use a spatula to pour the Hollandaise onto the eggs, carry plates to table. Breakfast! Cut into the perfectly runny eggs, the salty, tangy bacon, the warm dense bread, and spread over it all the incredibly perfect Hollandaise sauce. Smile as your tongue dances with happiness. This entry was posted in In the Kitchen (recipes & more) and tagged Backyard chickens, Corinna Borden, eggs, Eggs Benedict, Real Time Farms, recipes. Bookmark the permalink. mmmmhhh delicious, it is not as difficult as i thought.. I also tried the arabic version with arabic flat bread and it was great.